In April 2005, NVIDIA introduced it's SLI chipset for Intel processors. It was a step in the right direction for enthusiasts running Intel chips, finally allowing them to get their hands on dual-graphics technology. Many people might argue that many enthusiasts don't buy Intel these days, preferring AMD for its faster gaming performance. However, it's easy to forget that Intel still holds the lion's share of the market for new desktop machines and many enthusiasts who are new to the hobby are coming to it with Intel systems. Let us also not forget that the Pentium D 2.8GHz processor was one of the best-high performance bargains of last year. There's also another reason why NVIDIA is keen to develop chipsets that work with Intel processors: Dell. Dell ships more PCs than any other single company in the world, and getting chips into Dell's machines can mean oodles of extra cash coming in. In August, NVIDIA released the SLI X16 chipset for Intel in conjunction with Dell. The X16 was the first non-Intel chipset that Dell had ever shipped, and the double-whammy of motherboard and two graphics cards means that NVIDIA got a lot of love from the world's biggest system builder. At CES this year, we saw a prototype system from Dell and NVIDIA which had four graphics cards in a quad-SLI configuration. Whilst that is still to come to market, today NVIDIA is bringing out a product for the other end of the spectrum - the SLI XE chipset. XE is an updated version of the original SLI chipset, and is designed to occupy the mid-range of Intel SLI systems. Between the nForce 4 Ultra (entry-level), the nForce 4 SLI XE (mid-range)and the nForce 4 SLI X16 (high-end), NVIDIA aims to have all tiers of Intel systems covered. The idea is that if a system builder is putting together a new range of systems for customers, it could feasibly use NVIDIA motherboards top to bottom. 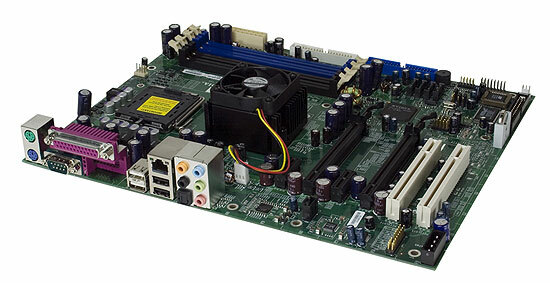 The nForce 4 Ultra doesn't support SLI, but the XE does, making this the entry level SLI motherboard. You don't get dual 16x slots, just dual 8x. Primarily, the XE is designed to replace the i945 and i955 chipsets as the mid-range performance mainboard of choice. The XE includes support for all Intel dual core processors. Those with good memories will recall that the original Intel SLI chipset didn't support the awesome 2.8GHz Pentium D - no worries with that here. This combination will make for a pretty awesome gaming system at a fairly low price. Gamers can choose to have two reasonably priced graphics cards, like the 6800GT or go for one expensive one (7800 GTX) and add another later. We haven't had a chance to play around with a production XE board, but we're going to take some time to outline the differences on the board and give you some insight and opinion into NVIDIA's general direction for the Intel platform.